During your opponent’s Main Phase: Special Summon this card as an Effect Monster (Machine/EARTH/Level 4/ATK ?/DEF ?). (This card is also still a Trap.) When an opponent’s monster declares an attack that targets this card: The ATK/DEF of this card become the ATK/DEF of the attacking monster. Once per turn, during your opponent’s End Phase: Set this card in its Spell & Trap Zone. Cyber Shadow Gardna is a Continuous Trap Card that becomes an ok Trap Monster. However, it doesn’t stay as an ok Trap Monster during your own turn. You can only activate this card during the opponent’s turn, specifically the Main Phase. Then, it doesn’t do anything unless it’s attacked by an opponent’s monster. If it doesn’t die, it’s re Set to your back row. Cyber Shadow Gardna keeps a ? Atk and ? Def unless it’s attacked. That’s a novelty in Yugioh. But it’s not enough. We end the week off with a Trap Monster card, Cyber Shadow Gardna. Cyber Shadow Gardna can be summoned during the opponent’s Main Phase only as an Effect Monster that is an Earth Machine with ?/? stats. Cyber Shadow Gardna gains the stats of the monster it battles while it is battling that monster. So your opponent likely has to suicide into this thing. Also, during your opponent’s End Phase, you have to reset this. This restricts you from using this monster as material for a Fusion/Synchro/XYZ/Link. There are far better ways to do what Cyber Shadow Gardna does, protecting your life points. I don’t think anyone will really consider this card for play unless you are playing a Trap Monster deck with Imperial Custom. Trap Monsters are fun. Note I didn’t say this/they is/are good, I just said they’re fun. 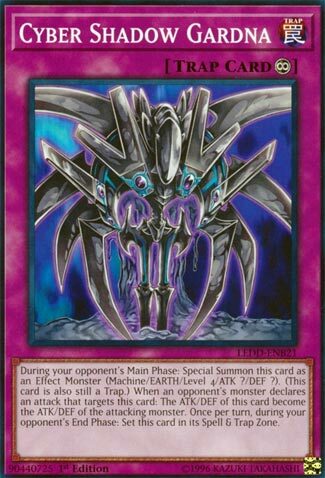 This card reminds me of Scrap Iron Scarecrow (shout out to Yusei) even though they’re only vaguely similar. This has to be used during your opponent’s Main Phase. Not bad, but I think this would be better in the Battle Phase. You get a Trap Monster who mimics the attack and defense of a Monster that attacks it. That leaves a Kamikaze option I guess, but this is still a Trap, and can be destroyed in all the ways a Trap can. It’s just not good enough. Still fun, just not good enough.